Izabella had tried to quit countless times during her eight-year addiction to nicotine, smoking at least a pack a day. Nothing worked–hypnosis, nicotine patches, inhalers, cold turkey–but she refused to give up. 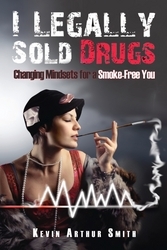 She discovered the book “I Legally Sold Drugs: Changing Mindsets for a Smoke-Free You” and has been smoke-free ever since. Author Kevin Arthur Smith grew up around smoking, beginning the habit himself at age 13. After 15 years of smoking a pack day and numerous failed attempts to quit, Smith finally created his own holistic and practical approach to quit. Months after breaking free from his cigarette addiction, Smith went on to purchase a gas station where it felt like he legally sold drugs by selling over a million packages of cigarettes. During this six year period Smith would share his method of quitting with his customers. With help from his customers this method of quitting was starting to become very effective. Each time someone would quit they would add a new technique to it.